RapSohD's competition finals in the performing arts titled "A Dream Comes True", was held - thanks to the support of the Administration and staff of the Cultural Department, Borough of Pierrefonds-Senneville - on Sunday, May 2, 2004 at the Pierrefonds Cultural Centre, 13 850 Gouin Boulevard West. The event, staged by Christopher Lester (John Abbott College), commenced with the parade on stage by eight young ladies to the strains of "Pomp And Circumstance 1", followed by the leading of the National Anthem in both languages and next their presentation of the theme song "The Impossible Dream". The competition was presented in two segments and interspersed with other activities or presentations. The first part was judged on appearance and personality, while the second part was based on talent. Eight young ladies between the ages of thirteen and seventeen years introduced themselves and offered their best performances before a receptive, appreciative audience and six judges, as they vied for the opportunity to represent Canada at the 34th annual Hal Jackson's Talented Teens International Competition, New York, July 24 - August 1, 2004. 2001 winner, Melina Soochan contributed a classical piano solo to the program and in keeping with the organization's aim of providing exposure for talented youth, performances by other invited artistes included hip-hop dancer Troy Clarke (14), fifteen-year-old violinist Amiani Johns, tap dancer Justin Jackson (14) and duo partner Ana Pacanins (14). The last two are students of the Ethel Bruneau School of Dance. Finally it was time for RapSohD's 2003 Miss Talented Teen and Miss HJTTI Canada, Mylène Otou, to give her parting remarks to all. 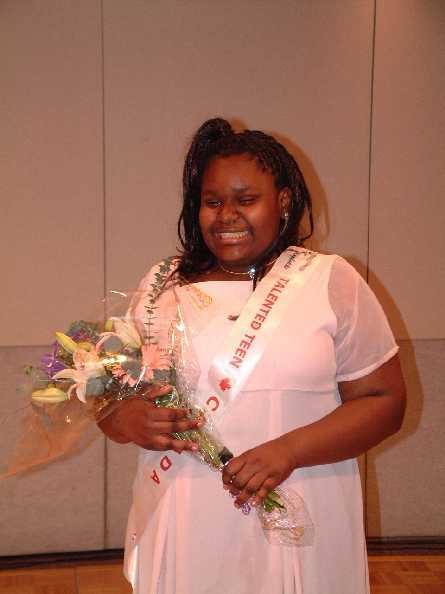 After an eloquent address in which she urged the contestants to always believe in their "capacities" and a final rendition of her winning song, the moment had arrived to distribute flowers and certificates to each participant, followed by the declaration of the winner and runner-up of the Canadian finals for Hal Jackson's Talented Teens International. DeCarla Clarke (13 years), a dramatist/poet, was runner-up to fifteen-year-old Khai Lewis-Welsh, who reached out to claim the title with a riveting rendition of "Somewhere Over The Rainbow" music by Harold Arlen. Khai represented Canada at the HJTTI competition in New York, in July 2004.